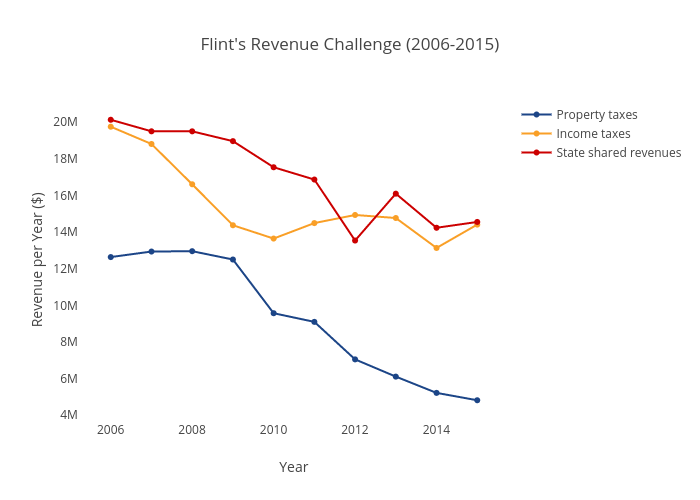 Kang-cacs's interactive graph and data of "Flint's Revenue Challenge (2006-2015)" is a scatter chart, showing Property taxes, Income taxes, State shared revenues; with Year in the x-axis and Revenue per Year ($) in the y-axis.. The x-axis shows values from 2005.4133757961783 to 2015.5866242038217. The y-axis shows values from 3748452.704416761 to 21012294.29558324.